HOUSTON — A Russian Soyuz capsule cast off from the International Space Station Monday (May 23), setting the stage for an unprecedented photo session in orbit to catch views of NASA's shuttle Endeavour docked at the orbiting lab. The Soyuz is returning Russian cosmonaut Dmitry Kondratyev, Expedition 27 commander, and astronauts Catherine (Cady) Coleman of NASA and Paolo Nespoli of Italy back to Earth after a five-month spaceflight. They will land their Russian-built Soyuz space capsule on the steppes of Kazakhstan in Central Asia at 10:26 p.m. EDT (0226 Tuesday GMT). Nespoli's high-resolution photos and video of Endeavour at the space station are expected to be retrieved after he and his crewmates land tonight so the imagery can be processed and released to the public, NASA officials said. Endeavour launched on May 16 to fly one last space voyage before being retired. The shuttle's six-man crew is currently midway through a 16-day mission to help support station operations following the end of NASA's space shuttle program. Yesterday, Kondratyev turned control of the space station over to fellow cosmonaut Andrey Borisenko, who will remain in command of Expedition 28 until his own return to Earth in September. After undocking from the space station, Kondratyev backed the Soyuz away toward a point about 656 feet (200 meters) for today's photo session of Endeavour and the station. 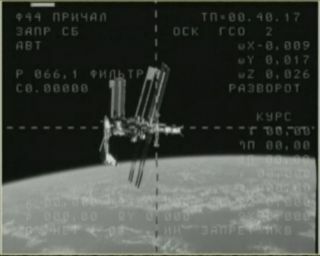 The space station also moved into a different position to provide a better view. The Soyuz was expected to pause for about 15 minutes, allowing Nespoli to position himself at a window in the Soyuz upper module to take video and photos of the space station and Endeavour. The maneuver was universally approved by space station mission managers with NASA and Russia's Federal Space Agency. The unique images of Endeavour docked at the International Space Station will have some engineering applications, but will also be used to celebrate the legacy of the station and the space shuttle program. Kondratyev, Coleman and Nespoli are scheduled to land in Kazakhstan at 10:26 p.m. EDT (0226 GMT Tuesday). Nespoli will be returning home after mourning the death of his mother from space. The Italian spaceflyer's 78-year-old mother, Maria Motta, died May 2 in her hometown just outside of Milan. Nespoli was notified immediately by the European Space Agency. Two days later, shortly after her funeral, Nespoli and his crewmates observed a minute's radio silence to honor Motta's memory, as the space station flew over Italy. "I think we've done a lot of great science, and certainly I think the space station is in a really good state for the future," Coleman said before leaving the station. Another three new station crewmembers are slated to launch to the orbiting outpost on June 7 to round out Expedition 28.